The perfect blend of science and poetry, Hidden City demonstrates that nature can thrive anywhere, even in highly populated areas. In this graceful collection of poems, skyscrapers serve as perches for falcons, streetlights attract an insect buffet for hungry bats, and an overgrown urban lot offers shelter to both flora and fauna. Hidden City also includes engageing supplementary materials, which provide scientific information about the animals and plants featured in the book. 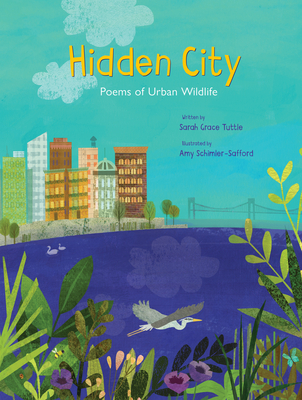 Coupled with beautiful collage illustrations, the poems in Hidden City offer readers the perfect reminder to notice and care about their environment. Sarah Grace Tuttle holds degrees in both environmental studies and children's book writing. Hidden City, her debut book, combines her passion for writing and dedication to ecology. She lives in Massachusetts, where she helps facilitate a local conservation group.Amy Schimler-Safford is a designer and children's book illustrator. She grew up in Miami, a city full of all kinds of unique plants and animals. She now lives in a wooded area in Georgia, where she frequently sees woodpeckers, beavers, herons, and deer. Visit her website at www.amyschimler.com.